Dr. Web finds not recommended site? When I click on =how to remove win 10 upgrades etc my protection blocks the URL -g.hacks as not recommended site ?? edit by mod- after consulting with OP we have altered the title of this thread out of respect to Martin. Is this the link you’re talking about? 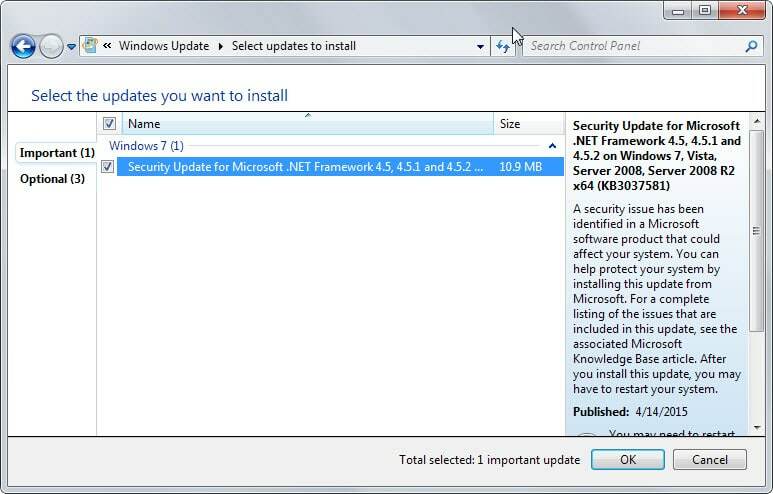 Find out how to remove Windows 10 related updates from Windows 7 and Windows 8 systems. YUP Hermitt I think my protection thinks there is malicious code installed . I cant remove it the only way is for the owners of G.Hacks to contact my protection company . WOW! What kind of protection software are you using? dunk, can you get it if you set your “Firewall” to let it through. DR Web Security Space covers everything from your PC to the web multiple actions strong firewall -full rootkit /virus etc protection -full email protection bios blocked from attack and a long list of other protection I have it for 3 years . Ronnie -I cant stop the URL being blocked even using the firewall . DR Web have a policy of making site owners contact them if they want white listed . If your security says don’t go there, then don’t go there. Mine says it’s ok so i’m happy. There are such things as being over cautious. Some folks are. It’s OK, but don’t ruin everyone elses parade. If I were Martin I would be here demanding a take down of this thread. To destroy someone’s reputation based on a mediocre scanner is irresponsible. I would advise anyone who reads this thread to not take it as anything more than an opinion based on a small time scanner result. You really see someone’s reputation being destroyed because there is a thread that the OP’s security software flags a site? Read through how Dr. Web works and make sure you visit the forums. Many a website owner ran afoul of their strict rules. Anyone reading this thread would probably view your reply as being the most opinion based, and least worthy. I did not wish disrespect to anyone but was only relaying what my protection was saying . If I had kept quiet then I would feel I wasnt giving security info that might be of help to somebody . DR Web is no "small time " but is used all over the World , I will no longer give info on any security box pop ups that appear on my PC. I chose that vendor as I have been attacked many times over the past 3 years ,not by hackers but by "others " because of my viewpoint . I know all about having to re-install my PC 6 times due to backdoor attacks using MS,s system programming . So I am exceptionally careful in any action that causes an alarm to ring on my PC maybe overcautious but it certainly helps me. I can only account for myself I have had one recently and that was in Bleachbit .exe it was deviously hiding away both in part of BleachBit -windows -C and in my shadow copy in O drive it was able to remove it from C drive but not the shadow copy as MS blocked it but I had no problem removing it myself . Thats the only time that DR Web came up with anything in months as it blocked the rest . Its been a good protection for me and isnt influenced by "governments " as some others are .You do know the regulations brought into law in relation to "access " to users PC,s both in the US and UK.? To destroy someone’s reputation based on a mediocre scanner is irresponsible. would advise anyone who reads this thread to not take it as anything more than an opinion based on a small time scanner result. Trolling will not be tolerated. And after eight years, this mod’s problems are to keep the nonsense off these pages. 2 other people disagreeing with the OP, nothing is said. Clique? Okay so what exactly is the program complaining about? Can you post a screenshot of the message and the address I get the block removed? It happened in the past that the “hacks” part of the address was enough to get the site blocked by awful security products. By no stretch of the imagination did I expected this type of criticism all I did was put forward what happened when I clicked on the page. It is as if invested interests are being hurt but why ? can a comment in a normal manner not be put on product that we all use . I have no problem being corrected if I make a mistake or if I mention a commercial product that works well for me ,should I not tell others ? I have zero commercial connection while I had when younger it was more in the tech repair aspect of electronics .I have posted on a well known upmarket hi-fi website know Worldwide I put my views and so do others but in a calm manner BUT the Moderator there had to ban people posting continuous adverts for their businesses as well as advertising their own services on a commercial basis but Hiding it under a cloak of = "I can build this for you or design this for you in other words using the website as an advert for their own business which probably wont be declared to the US tax authorities. HTG is ,yes a Worldwide Institution I am glad to be a member but I will not get into a slagging match with anyone as that pulls down any website. Dunk, you have the ear of the site in question, and hello Martin. Can you do as requested, post a screenshot of the flag you’re getting from Dr. Web? That will go a long way in helping Martin sort through the issue. URL= http://cdn.ghacks.net/wp-content/uploads/2015/04. I have said it before I cannot change what Dr.Web has classed as an "unsafe site " even approaching them as a customer does not change anything . The official response is -Quote =The website owner must approach our tech . department and they will advise the reason it is flagged up. If you view a previous example their staff pointed out an obscure piece of data when another site owner complained and when he had removed it it got a green response . I am not going to ignore my protection as it has proved to me to be better than a lot of others. I have nothing against the site owner or any of his policies but I have learned the hard way in regard to being careful on the web. So it will not tell you what the problem is so you can determine whether or not it actually is a problem by further research. I would never depend on someone else to to make those determinations for me. Sounds like it could become a scam and a hold up for legitimate sites. I personally do not let unknown people with unknown motives make those determinations for me. And I certainly would want at least a second opinion before I posted such a scandalous title on a popular web site board. At a minimum you should put a question mark at the end until it is firmly and OPENLY determined by more that one source.